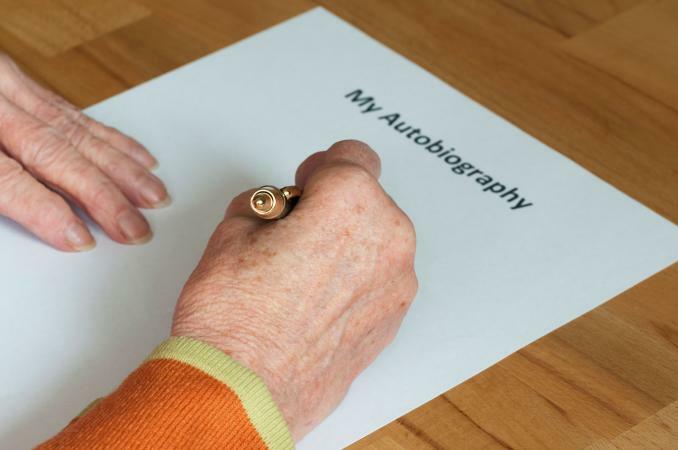 If you've ever thought the events of your life would make a good story to be read by family and friends, or even by the public, you might want to consider writing an autobiography. It's a considerable undertaking, and it might make you feel intimidated and unsure about how to begin. The task will be manageable, though, when you break it down to simple, logical ways to get started. To start on a solid foundation, you need to consider why you wish to write your autobiography. You might want to inspire people. You might want to share your story to help those who are on a similar road in life, or you might have led an unusual life that would be of interest to large audiences. Sometimes people write autobiographies to deal with difficult emotions they harbor about their past. Your motivation will play a part in how you structure your story. In figuring out the shape of your story, you might want to think about the similarities and differences between an autobiography and a memoir. In the past, a written account of a person's life was usually called an autobiography. In the present day, though, people often use the term memoir. The boundaries between the two terms are admittedly blurry, and many people tend to think of them as synonymous. Memoirs have traditionally been considered more personal and narrower in focus, but these days, books that are considered autobiographies include deeply personal elements that go much farther than a chronological recounting of facts. Since an autobiography is your story, it's up to you to figure out how you want to write it. Not everyone starts writing a story from the beginning. There are plenty of other ways to get started with telling your story. You are free to approach the project any way you wish, as long as it works for you. For some writers, the way to start telling a story is to start at the beginning and build from there in a linear, chronological fashion. In the case of an autobiography, you would start with where and when you were born. Include information about your parents and whether you are the oldest, middle, or youngest child in your family. With this technique, you will need to think through the events of your life in the order in which they occurred. Hopefully, one series of memories will lead into the next as you're writing your outline or composing chapters for your autobiography. Write your story in chronological order, adding details that you want to share with your readers. Another way to get started with writing your autobiography is to use the present circumstances of your life as a starting point. Your current life situation might make a great hook to get your readers interested in what you have to say. After you describe your current life circumstances, you can then go back and explain how the events of your life and the choices you made brought you to this particular point. Your autobiography is your own story, so you are in control of how you approach it. Your writing goal should be to share your unique perspective about the events in your life that have made you the person you are today. Remember that only you know how you've perceived the events that have shaped and formed your life, so you're the best person to explain your thoughts and motives. Share what you wish, and structure your story in the way that makes the most sense to you.